theatre of noise: Travel the Limerick-Toronto Subway! Welcome to the longest subway line in the world! 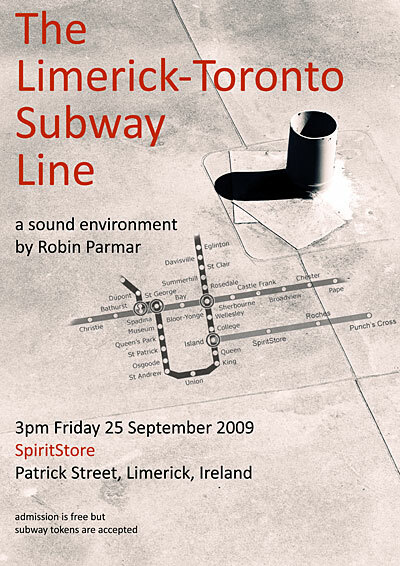 The Limerick-Toronto subway spans thousands of kilometers, but is yours to travel through the medium of sound this Friday at 3pm. The location is the SpiritStore arts cafe, Patrick Street, Limerick. Admission is free, but subway tokens will be accepted. The SpiritStore has been running for six weeks as a casual arts workshop. People have given talks on everything from astronomy to social activism. I have noticed that many of the speakers have had to apologise for the traffic noise coming in from outside the Store. The corner is one of the busiest in the city. Friday at 3pm it will hopefully be at its craziest, because I will be harnessing the sounds of this traffic to create the world's longest subway line. This will be augmented by recordings I made this past summer in Toronto. Following the performance I will be available for a casual Q&A over a complementary cup of tea. This Friday is also Culture Night in Limerick. After riding the subway, why not set off around town to explore what joys Limerick has to offer? The Limerick Leader and Limerick City Council sites have more info. Thanks to Marilyn Lennon and all the volunteers at the SpiritStore, for making this event possible.